The highlight of our Sunday in Key West was our annual afternoon of Drag Bingo. It's best described as a merge of Rocky Horror and Catholic Church Bingo. Myron and I both won two rounds. As tradition has it, winners have to wear the wig and glasses included in their winners bag of crap for the whole night, so we did. Of course, winners also get their shot glass filled (also included in the bag of crap) every time B-12 is called. Downstairs, a surprisingly spirited night of karaoke was going on, but the best unexpected highlight had to be when during "Dancing in the Streets," they actually emptied the club and danced in the street, creating one of the only traffic jams you'll ever see in Key West. Just another day in Paradise. Our day in Key West was pretty uneventful. In fact, if anything, it was hard to not feel guilty about letting the day slip by without doing anything of consequence, but I tried to remind myself that that's exactly the point of being here. We did walk down to Sandy's for Cuban Sandwiches and plantains. Sandy's has a reputation for having one of the best Cuban Sandwiches on the island, (I think Jose's Cantina is equally as good), but I do have to make mention of the plantains - they are easily far and away the best I have ever had anywhere. They alone are worth making the stop at Sandy's if you're ever in Key West. Other than that, for now I'll just share a few other 'like no other' sights that amused me: from the painted fire hydrants here...to the ad for Ocean Walk Apartments that seems to be proud of the fact that they are the only "corporate owned apartments" on the island - as if thats a good thing??! (and typeset in Souvenir or Cooper Bold, no less)...to the best political slogan ever on a bumper sticker ("he's such a hottie")...Every time you turn around there's something else to chuckle about. Key West is truly a world unto itself. Time continues to be a surreal concept on this years trip. After never getting off of California time while in Virginia, I had to manage to leave my folks house at 3am for a 6am flight to Miami and several hours of head-nodding layover before getting my flight down to Key West late in the afternoon. But I made it. And all you have to do is land here to feel the transformation this place brings - its magical. More things have changed as we seem to see every year - a few more old local institutions are gone and more chains, condos, and "nice" new development is replacing them. The spirit of the island manages to remain though, hopefully it will win out in the long run. Stay tuned for more from the Conch Republic over the next few days. Some shots from Christmas and Christmas Eve... Our neighborhood lines the street with luminaries on Christmas Eve. Its a common Virginia tradition, but a new one for our street that was started a couple years ago by a neighbor who lives on our block. We usually don't get to see them lit because we spend Christmas Eve with my sister Jayne's family about an hour south down the Shenandoah Valley. They have a new pool table - apparently my nephew Sumner is a pool shark in the making. Back at our house - Between my Dad, me, and my niece Marlena, a glowing apple on a lap is a common sight around the house, much to my Mother's dismay. Christmas morning didn't come as early as it felt - I still haven't gotten off of my California time schedule. Even the dogs were tuckered out. Hope you had a great Christmas, too. Every year Mom and Dad make a Christmas card with their dogs Phantom and Edn in a different situation (a Christmas edition of a layman's William Wegman, perhaps). A couple days ago I posted pics from the photo shoot, which I got participate in/witness for the first time. Dad always makes a multipage online version. He emailed links to his the other day, but didn't announce the card on his blog til today. I threatened to post it sooner on my blog, but he said if I did, he would tell everyone that I was responsible for the typography on the card. I tried to convince him of the joy and beauty in the simplicity of Helvetica; he maintains that he prefers Apple Chancery and Chalkboard (a bad version - as if there is a good version - of Comic Sans). I guess I know where my design genes didn't come from! Regardless, I can now release the link to this years card. Enjoy. "...pretty little thing, isn't it?" I saw this video today on Current, but its interesting to me that I have a childhood connection to this song. I doubt I was watching Bing Crosby's "Merrie Olde Christmas" special in 1977, when this aired. But it was rereleased as a video in 1982. Thats a year after MTV was born. Remember at the time how every broadcast and cable had videos in any open spot the could find a la "Friday Night Videos" on NBC? Surely I saw this video countless times during those years when videos were new; so thats probably where my connection to this comes from. But how did it come to be originally? 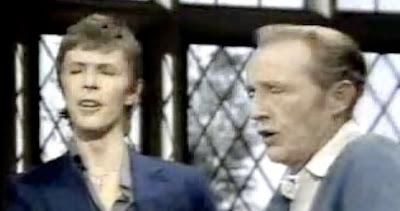 Bing Crosby and David Bowie had never met before, but the 1977 special was set in England and featured appearances from other British stars as well. They were originally supposed to sing "Little Drummer Boy," but when Bowie showed up for the taping, he said 'I hate that song, is there anything else I could sing?' Ian Fraser, Larry Grossman, and a team of composers and writers went into a frenzy and in less than 90 minutes wrote and composed "Peace on Earth" and arranged it as a counterpoint to "Little Drummer Boy." Bowie loved it. That was September 11, 1977. Bowie was 30 at the time, Crosby was 73. A month later, Bing Crosby died. A month after that, the special aired for the first time on CBS. It stayed fairly vaulted until 1982, when it was rereleased, and has since become a holiday staple. Today the song even lives on through YouTube. I think its still my favorite Christmas arrangement of a Christmas song still today. And ever timely as well. Peace on Earth. indeed. Not a whole lot to report here... For being home for the holiday, I've been strangely busy the whole time wrapping up loose ends that fell by the wayside due to that project I was working on right before leaving California (which came out great - details on that in January after it hits the air). Got a good chunk of stuff done today and yesterday though, so I'm in less panic than I was 12 hours ago. So for you, just some shots from small town Virginia. Edn (or is that Phantom?) playin on the floor; a sign at a Vets office we went by today (I still can't make sense out of that one. Read it twice. ); and some shots from a dinner I went to tonight with Mom and Dad. It was at a little church in Berryville (yes, Berryville), the next town over from Winchester, for a concert of Dulcimer music by one of Mom and Dad's friends. Mom has a dulcimer group here in town she plays with regularly, so I got to meet a few of the members from her group. Though I have to admit I snuck out early to add my part to the 'Super Saturday' economy figures. I'd rather hear Mom play anyway. So after an exhausting week on a great project, I made it home to Virginia for Christmas. Any of you who have followed the blog the last couple years around Christmas have "met" Mom and Dad's dogs Phantom and Edn. Edn loves to push the boundaries by climbing on the sofa in order to climb on top of you. Those of you who know Phantom and Edn may have also seen the annual Christmas Cards that Mom and Dad send. Mom send the photo cards, and Dad does a more elaborate online version. Tonight, I got to be a part of the joy of the photo "shoot". Phantom is Edn's mother - older, wiser, calmer. When it came to putting the candy cane hats on, Phantom wasn't bothered in the least. Edn, on the other hand, was having none of it. Eventually, Dad ended up with his shots. When the online card is done, I'll post a link. For now, you can see previous cards and other Phantom and Ed posts from the link below.